ConvertKit. MailChimp. Mad Mimi. Jetpack. FeedBurner. FeedBlitz. The options are endless for sending out your blog posts via email. Then everyone starts saying you need a newsletter–and a free download to go with it. And you’re even more confused. Hopefully these posts will help clear the confusion and explain not only the how, but the why of email lists and newsletters for bloggers and authors. And if you still need help, you can always hire me! Wondering how to get your blog posts to your readers’ inboxes? Here are the advantages and disadvantages of 5+ popular ways to send your blog posts via email. Want to know how much it’s going to cost to build an email list? Curious how to include a free download for your subscribers? Wondering whether to choose MailChimp or Mad Mimi? This is the post! Not sure whether to choose ConvertKit, MailChimp, or Mad Mimi? In this post, I outline the positives and negatives of each service. 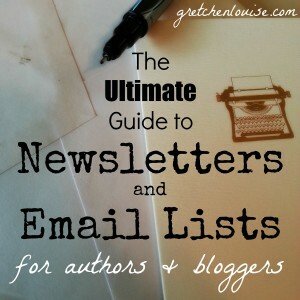 In this post, I talk about the importance of email lists for authors. What’s a newsletter? How is it different from blog posts via email? Check out Trina Holden’s post on Allume and you’ll be inspired to start sending out a newsletter, no matter your list size! Want to streamline your email lists so that your subscribers can choose to get your newsletters, your blog posts, or both? I outline the details here. Bonus: all sorts of creative signup form examples! Subject lines to plain text, templates to headers, and everything in between. Here are my top tips for email campaigns and newsletters–all in one list. My friend Dawn Perkins provides a helpful breakdown regarding policies for use of affiliate links in your email campaigns. I pin all the helpful posts I come across about email lists and newsletters onto my Pinterest board. Be sure to follow it!